Hello Everyone!!! It's Isha here with my 2nd. post as the guest designer. today. So for today's post, I decided to create a canvas. 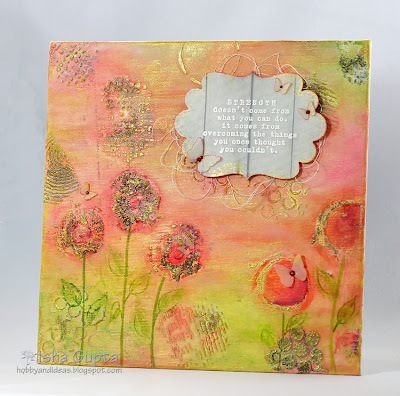 I used some wonderful products by Faber-Castell and a stencil from the shop. Sometime I enjoy working with layers of colors and that is what I did today. Love your layers of colors! Gorgeous! The gold adds so much, too! Fab canvas , Isha! Great texture, wonderful colors - beautiful canvas Isha! Beautiful canvas! The texture makes me want to reach in and touch it.. GASP!!!!! WOW!!!! This is amazing!! Love the color and the gold accent.